With the onset of the winter holiday season, I’ve been looking through December issues of the historic newspapers, enjoying the nostalgic illustrations, articles and advertisements from seasons past. You can do the same on Chronicling America, where issues of the Sumpter Miner and Klamath Falls Evening Herald are available for public viewing. 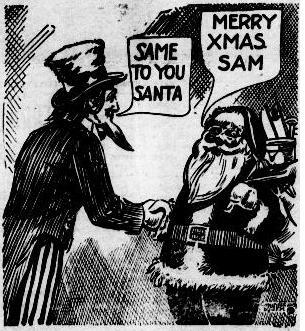 In turn-of-the-century Sumpter and Klamath Falls, people certainly got into the Christmas Spirit: when I performed a simple search on the word ‘Christmas,’ I received 1774 results! My search on ‘Hanukkah’ (variant spellings included!) failed to turn up a single item in either of the Oregon papers. (This is probably reflective of period demographics in Eastern Oregon–it will be interesting to retry the search once the titles from Portland and Salem are available.) The earliest reference to Hanukkah that appears anywhere in Chronicling America is an item from the Hebrew Observer reprinted in the December 24th, 1885 issue of the Daily Honolulu Press. The earliest full and detailed article about the Jewish Festival of Lights was published December 17, 1887 by the Waco Daily Examiner. For the time being, at least, we can’t expect to find information on ‘Kwanzaa’ in Chronicling America: the first Kwanzaa celebration was in 1966-67, and the digitized newspapers only run through 1922.